When I was a shy girl in pigtails, I collected stickers in my gold vinyl sticker book. I would regularly flip through the book admiring my latest puffy unicorn or scratch ‘n’ sniff Strawberry Shortcake, deciding which stickers to keep and which ones to trade with a friend. I still love stickers; there is something so tactile about them in today’s world of screens. My son and I add one each night to the wall calendar by his bed to reveal the next day’s plans. These days, I have an intangible collection – recipe ideas stored in a file on my computer. Although the collection has no monetary value, scrolling through it and imagining cupcakes to come brings me the joy of a new Smurfette sticker. I build my collection daily after getting out of the shower, coming home from a great dinner, chatting with you on Cupcake Project’s Facebook page, or spending way too much time on Pinterest. This summer, I went to a taste of Mexico dinner at Milagro Modern Mexican Cuisine put on by Slow Food St. Louis. I was blown away by the chocolate tamale – a chocolate-filled version of the classic Mexican dish made by steaming corn dough stuffed with meats, cheeses, or veggies in a corn husk. 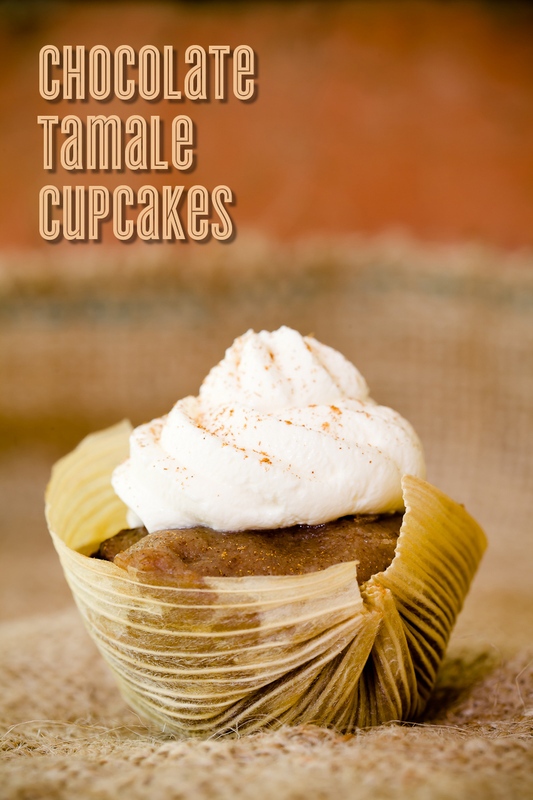 This dish took a prized place in my collection, and I knew I would be making tamale cupcakes for Cinco de Mayo! In my chocolate tamale cupcakes (based on the lovely recipe for chocolate tamales on Homesick Texan), I sweetened the corn dough with brown sugar, spiced it with vanilla, cinnamon, and cloves, mixed rum-soaked raisins into the corn, and filled the tamales with spiced Mexican chocolate. 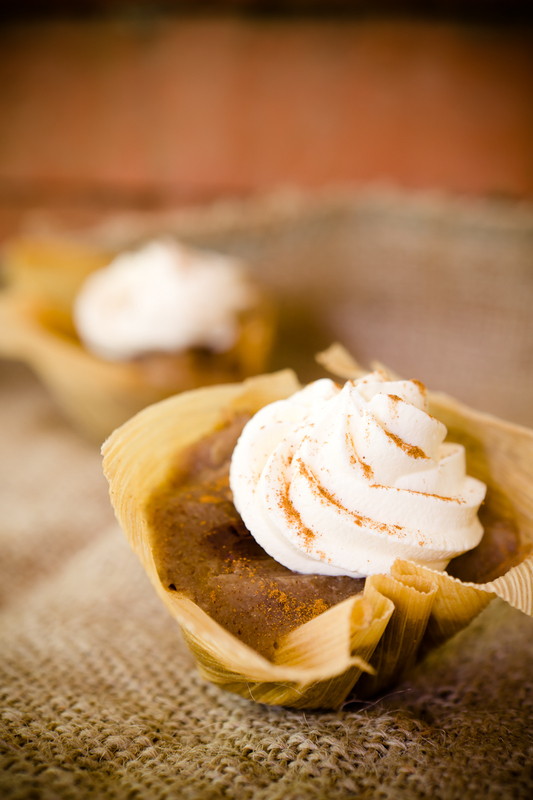 Even though these chocolate tamale cupcakes are clearly dessert, it’s hard to avoid making an entire meal out of them, when they are are served warm with a dollop of sour cream sprinkled cinnamon. 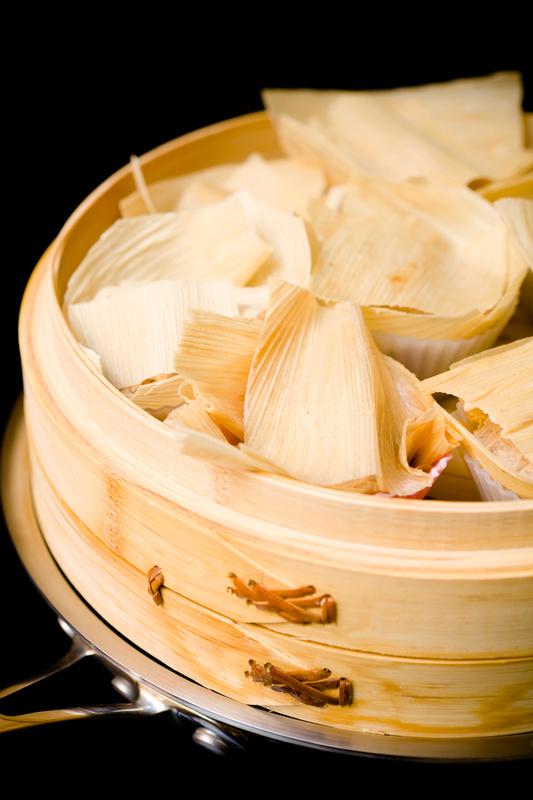 Masa harina is a very specific type of corn flour used for making tortillas and tamales. You can find an excellent description of masa harina on TLC. If you can’t find masa harina at a local Mexican grocer, you can purchase masa harina online. Abuelita is a Mexican chocolate made by Nestle with sugar, cocoa, and cinnamon. 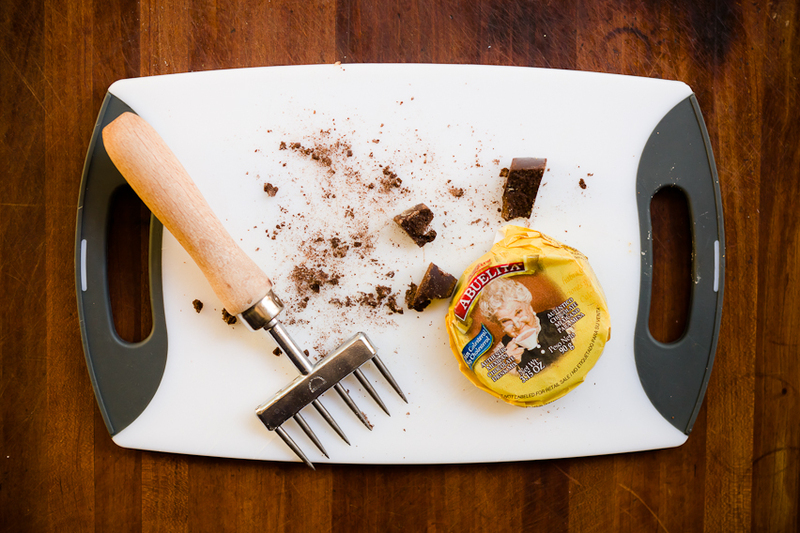 If you don’t want to buy Abuelita, you can use an equal amount of chocolate chips instead. As I mentioned above, my chocolate tamale cupcakes recipe is an adaptation of the chocolate tamale recipe created by Homesick Texan. The recipe with my adaptations is below. Place the corn husks in a pot filled with water and submerge until completely covered. Soak for 20 minutes or until soft and pliable. You don’t have to worry about over-soaking – so you can do this step the night before you if you’d like. In a medium-sized mixing bowl, mix the butter and brown sugar until fluffy. In a separate medium-sized mixing bowl, mix together the masa harina, cinnamon, vanilla, ground cloves, and salt. Stir the water and milk into the corn mixture until it becomes a moist paste. Add the corn mixture to the creamed butter and sugar and whip until fluffy. Optionally, stir in the raisins. Cut off a square-ish piece of corn husk just larger than a cupcake liner. Press corn husk into a silicone liner. It’s OK if the husk doesn’t quite hold the shape – once you add the filling, its weight will hold the husk down. Although you will not be baking the cupcakes in a cupcake tin, I found it easier to do the prep work with the liners in a tin. Fill the husk halfway with the corn mixture, packing it down firmly with your fingers. Drop a piece of Abuelita (about 1/8 ounce – but you don’t need to weigh it) into the center of the corn mixture. Fill the husk to the top with more corn mixture. Cut a small square of corn husk and lay it over the top of the corn mixture. Repeat steps 6-11 for all of the cupcakes. Steam the cupcakes. I steamed my cupcakes in a bamboo steamer placed over a large skillet (shown in the photo at the beginning of this section). The nice thing about using a bamboo steamer is that there are multiple layers – allowing you to steam all of the cupcakes at once. You could also use a metal steamer basket over a pot, but it might be hard to fit all of the cupcakes inside the basket. Either way, load your cupcakes (still in the silicone wrappers) into the steamer and place them over the wok or pot filled with water just high enough so that it doesn’t touch the steamer. Bring the water to a boil and then cover the steamer and turn the heat down to medium-low. Steam cupcakes for one and half hours for softer tamales, or two if you like your tamales more solid. Be sure to check on them periodically to ensure that there is still enough water in the wok or pot. 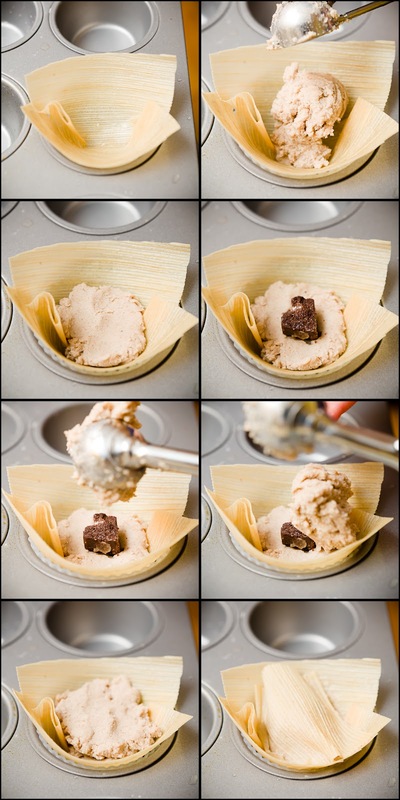 Remove the corn husks from the silicone liners and remove the top piece of husk from each cupcake. Serve warm and optionally top with a dollop of sour cream and a dusting of cinnamon. If not eating immediately, cool to room temperature. Then, cover and refrigerate. When ready to eat, microwave for a few seconds at a time to warm them.